i8 Gallery is proud to present an exhibition of works by Hördur Ágústsson, Camilla Løw, Sérgio Sister and Thór Vigfússon – artists of four generations with similar sensibilities to form and colour. The works featured in the exhibition, made between the 1960s and the present day, are rooted in geometric abstraction and share an industrial, angular approach to pure formalist aesthetics. The artists draw upon the visual language of movements ranging from Constructivism to Minimalism. A true Renaissance man of the visual arts in Iceland, ágústsson enjoyed a multifaceted career as an artist, architect, designer, critic, academic and educator. In the early 1950s ágústsson was amongst a group of young artists who introduced geometric abstraction to Icelanders. He was the primus motor in the integration of art and design in the spirit of the Bauhaus and called upon social-utopian ambitions in his practice. Rigorously studying form and colour theory, ágústsson strove for fundamentals and tested the expressive potential of basic forms and primary colours to the fullest in his paintings and drawings. The sketches and drawings in this exhibition (made between 1955 and 1975) give insight to ágústsson’s developing abstraction. His research eventually led him to use coloured tape, rather than oil paint, as a medium – a discovery that can perhaps be ascribed to his work as a designer. The tape, with its primary colours, became the most important medium for him during the remaining years of his art practice. Explaining his choice of materials, he stated, “In works such as these, all borders must be clean and straight…The colours blend in the retina but not on the surfaces, resulting in a much stronger effect.” ágústsson retired from visual art in 1978 to devote himself entirely to architecture. Løw’s practice playfully revisits modernism and twentieth-century sculpture from a contemporary perspective. Her work is composed of painted wood, sheets of Perspex, concrete, steel and rope in a palette restricted to a handful of strong colours. The sculptures on show here are suspended square forms – empty frames with a glossy finish and sheets of black and white Perspex reminiscent of record album covers – all casually hung with string. 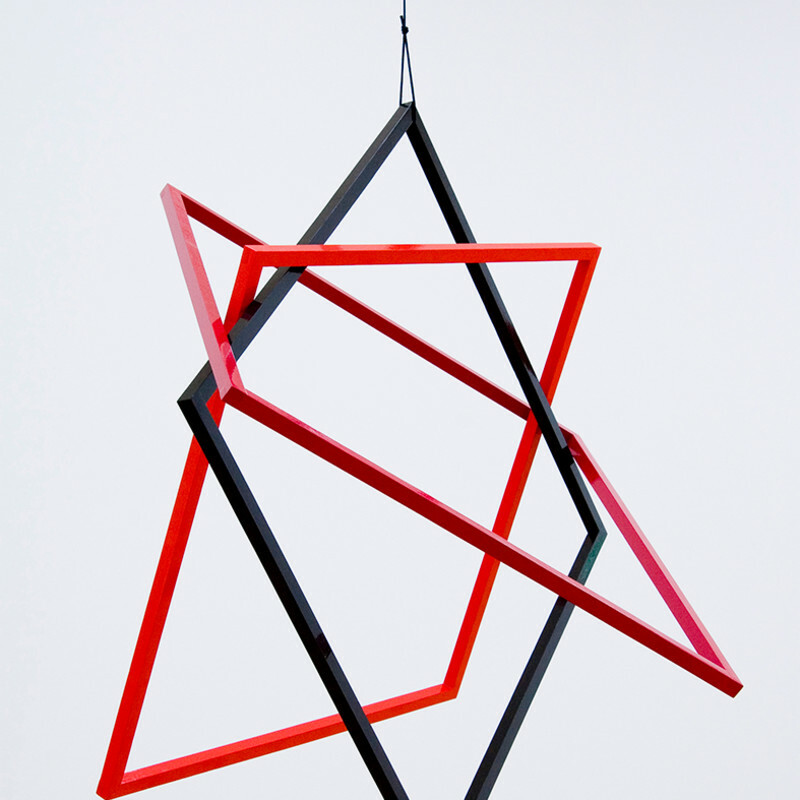 The viewer’s bodily experience of space is an important factor in the work, and Løw positions her sculptures as if they were three-dimensional paintings: as she states, “I often think of my sculptures as lines in space or signs in space.” Though her works are geometric and abstract, Løw’s personal touch shines through. Titles such as Valentina manifest Løw’s use of man as measure, both in scale and in essence – hers is a subtle anthropometric, even anthropomorphic approach, though it is in no way organic. She draws on poetry, typography, architecture and other elements of everyday life in stark contrast to the anti-humanist history of Minimalism. The outcome has been associated with such contradictory influences as Op art, Russian Constructivism, New Romanticism and even punk. Sister is best known for his three-dimensional paintings, particularly his Caixas series made from wooden slats which the artist arranges into sculptural compositions resembling crates or window frames. In Sister’s quest for new ways of conjoining areas of colour and extending spaces and voids, he found a solution in a chance encounter with fruit crates. He disassembled the boxes and painted the slats, which functioned like thin bands of vertical stripes when rearranged in various combinations. This method allowed Sister to place pure colours in direct contact with the resultant spaces around and between them, introducing possibilities for light and shadow to his former practice of colour field paintings on canvas. While the fruit crates that originally inspired this series may carry certain social connotations related to their use, the boxes Sister creates are pristine, abstract visual forms. Throughout his career, Vigfússon has investigated the interaction between art and its surroundings through works made of glass, mirrors, Perspex and Formica. Vigfússon’s diamond-shaped wall works in this exhibition are each composed of six individual glass panes of different colours forming horizontal stripes in the otherwise vertical objects. Like all of Vigfússon’s work of the last two decades, these pieces are the products of methods and materials from industrial manufacturing. Each piece of cut glass is coated on one side with enamel paint in a hue selected from the RAL system of standardised industrial colours. As with Vigfússon’s other glass pieces, the reflectiveness of the glass results in an interplay between the works and their immediate environment. However, the diamond-shaped pieces differ from his earlier square-shaped works in that they resist the allusion to “pictures on a wall”. Despite being distinctive geometric forms devoid of symbolic reference, their scale and vertical orientation make it tempting to relate to them on a human level.